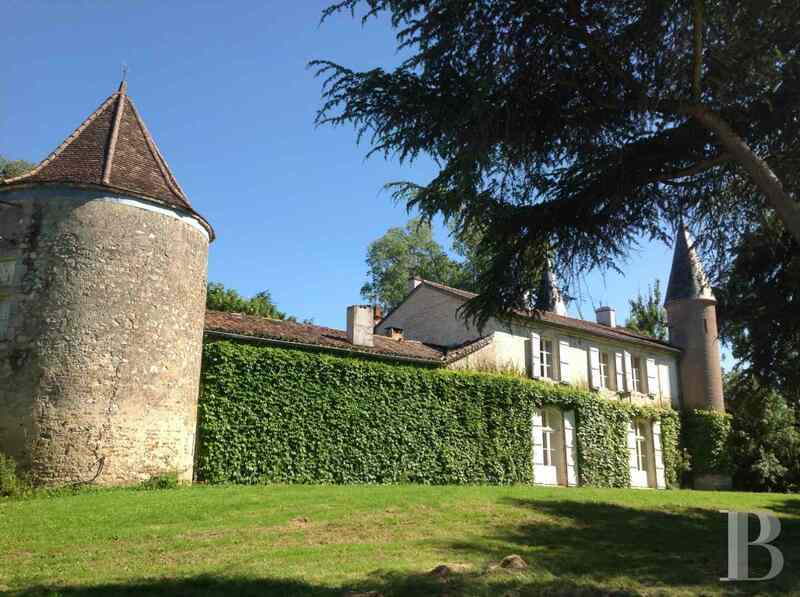 A small, elegant, 18th century chateau, steeped in light, set in 7 ha on the banks of the Garonne on the outskirts of Agen - chateaux for sale France - in South-West, Perigord, Dordogne, Quercy, Limousin - Patrice Besse Castles and Mansions of France is a Paris based real-estate agency specialised in the sale of Castles / chateaux. 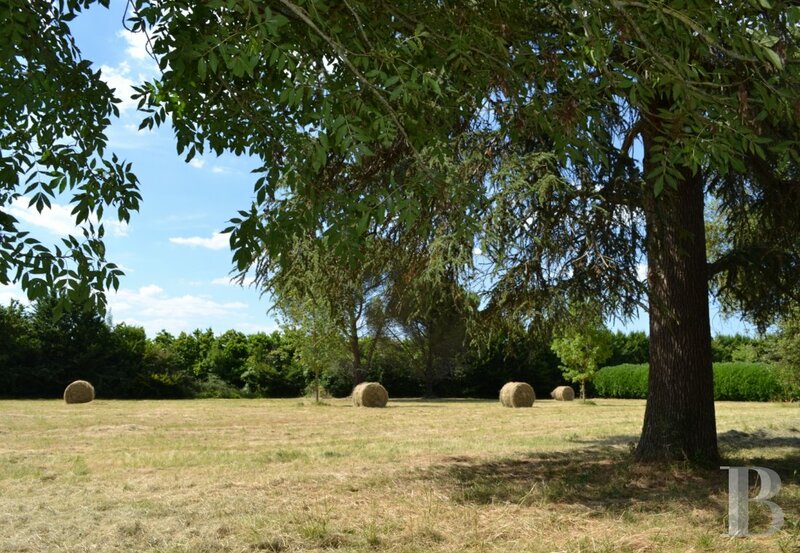 On the outskirts of Agen, a town with an excellent TGV train service (Paris in 190 minutes), an airport with 3 daily return flights to Orly and just 5 minutes from a slip road on to the Bordeaux-Toulouse motorway. The town has developed its economic potential partially through the creation of the “Agropole”, a showcase for the region’s agro-food industry. UPSA, a pharmaceutical laboratory founded in Agen, has two sites here. The town has a sub-branch of Bordeaux University, providing a number of courses. 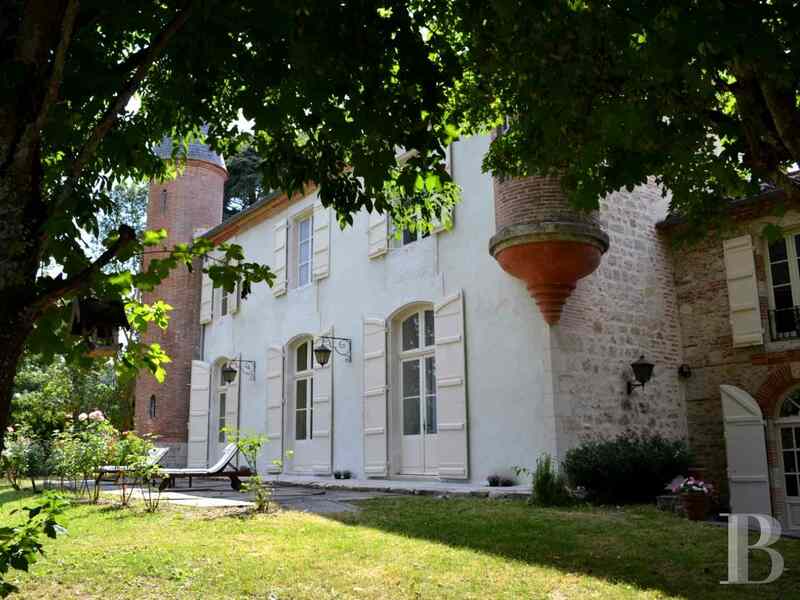 It has a very active theatre and a cinema complex, a golf course 2 km away and a cycle path alongside the river Garonne. 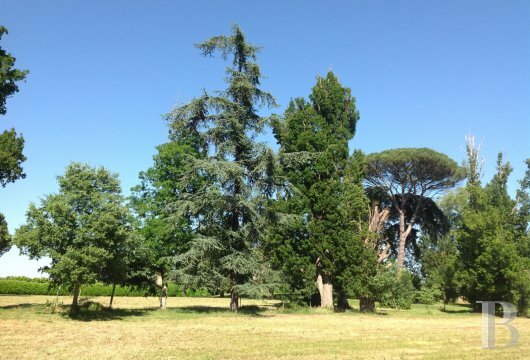 The three hectares of parklands, quite an arboretum surrounded by thick laurel hedges, constitute a protective verdant rampart and conceal a further three hectares of farmland. 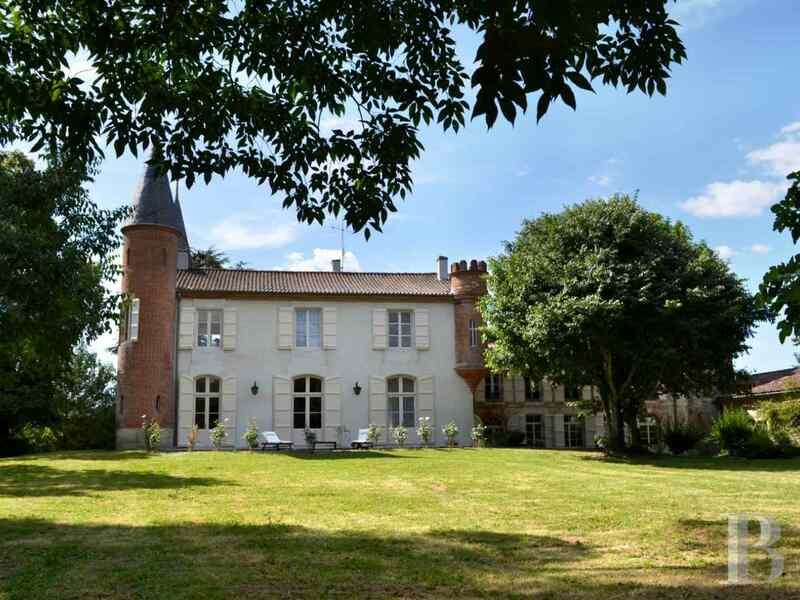 This chateau appears timeless with a little access lane, entrance gates, a driveway crossing the parklands, bordered by two hundred year old, pyramid-shaped oak trees with their thick, furrowed bark and a last bend before it comes into view. 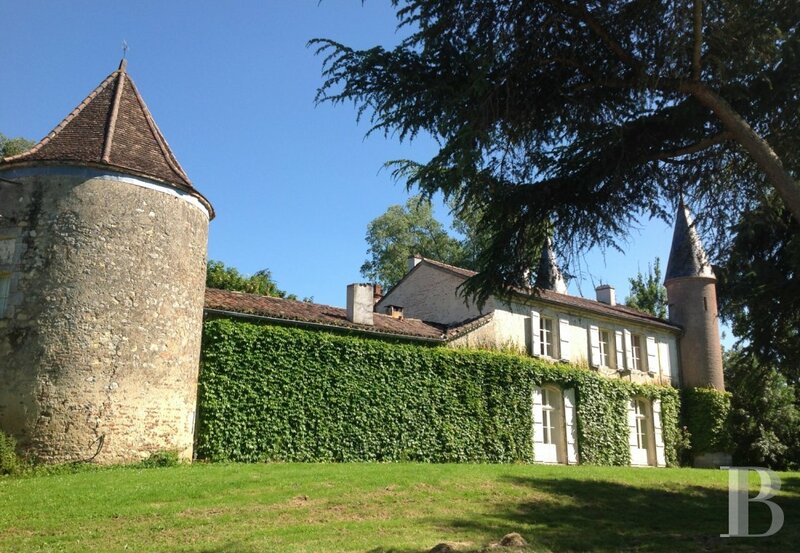 With its turrets, its brick and stone walls, it brings to mind a poetic, Romanesque world, perhaps that of “Le Grand Meaulnes” set in its secret Sologne region. So near, and yet so far from town. This property comprises three main buildings, two of unequal heights following one on from the other with an outbuilding set at right angles. 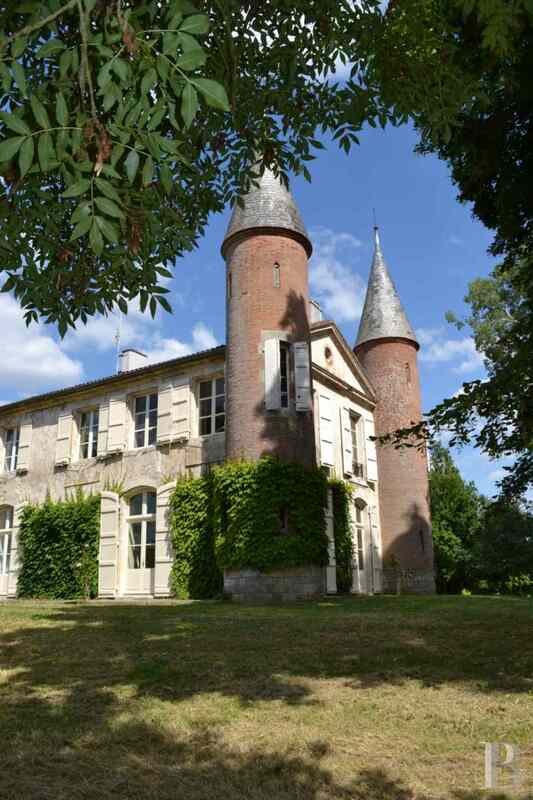 The actual chateau is a tall construction, with an upstairs, built of rendered stone and brick, covered with ampelopsis. 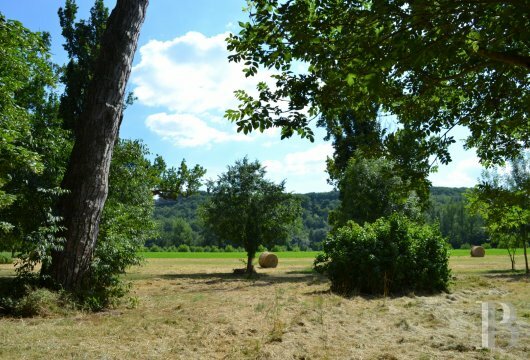 It stands on a feudal motte, like all the old constructions in this Garonne Valley which was once liable to flooding. It is flanked by two towers with candlesnuffer roofs, on the south-east and south-west corners, whilst a battlemented turret, with corbelling, adjoins the north-east corner. A triangular pediment, constructed from old bricks bearing the patina of time, is set between the two corner towers on the south-west facade. 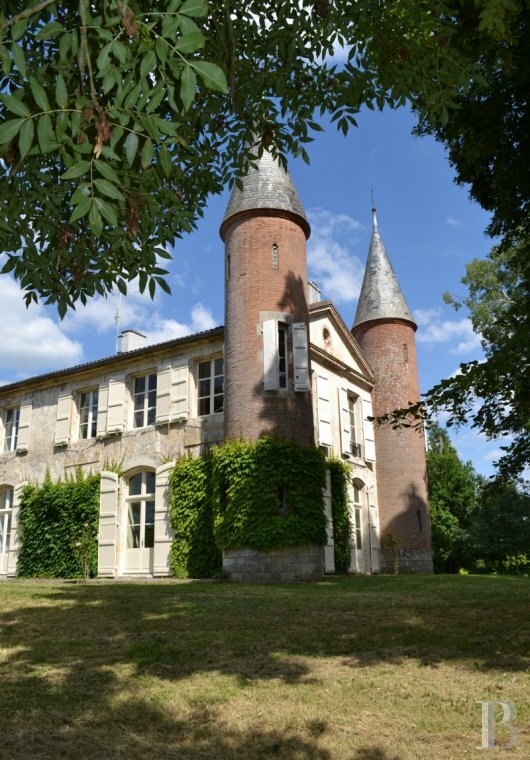 The main, south-east facing facade of the chateau features three French windows, with curved lintels, and three upstairs windows. The south side has two French windows that are also curved. A stone pavement borders this section on three sides. With three south-facing windows and two French windows, it is followed by a lower wing, the end wall of which diagonally faces the outbuilding, standing at right angles. A round tower, with a polygonal roof, is set in the angle so formed. 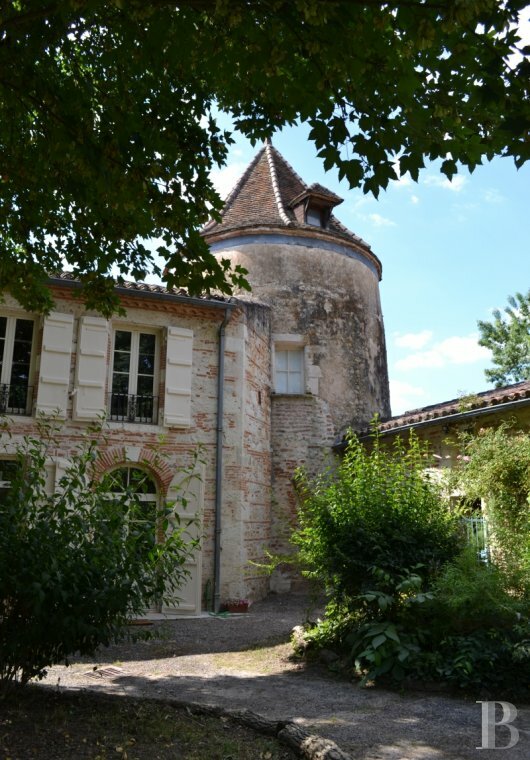 This probably dates from the 15th century and, prior to being converted into a wine storehouse, was a chapel for the primitive chateau. A tall French window, on the east side, opens into a large gallery which separates two lounges. The floor is paved with Gironde stone tiles. 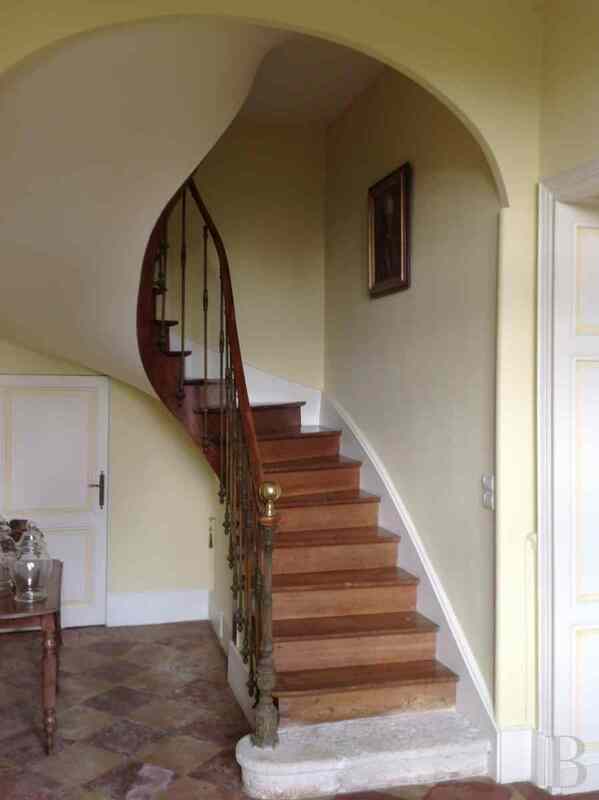 At the end is a stairway with a wooden handrail and wrought iron bars. A door next to this, on the west wall, opens into a toilet. The gallery leads, on the south side, to a first lounge. 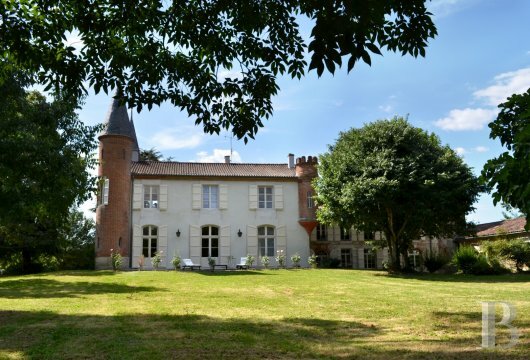 It runs the full depth of the chateau and its four tall French windows, with glazed fanlights, look out over the parklands, one on the east side, two on the south side and the last one on the west side. This triple aspect room is flooded with light all day long, almost as if it let the verdant parklands right into the house. The marble floor features inlaid marquetry. 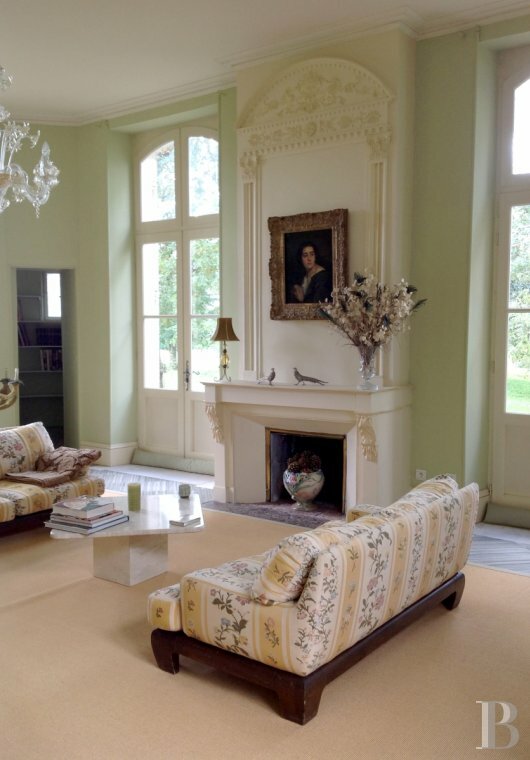 On the south wall is a white painted fireplace, with a sculpted marble mantel and a trumeau with decorative plasterwork. Little doors in the two corners open into two round rooms, both converted into libraries, at the bottom of the towers. The second lounge, on the north side of the gallery, is narrower but just as deep. It is illuminated via two large French windows with glazed fanlights. This room is equally as luminous courtesy of its pale yellow painted walls. The floor is paved with Gironde stone tiles. 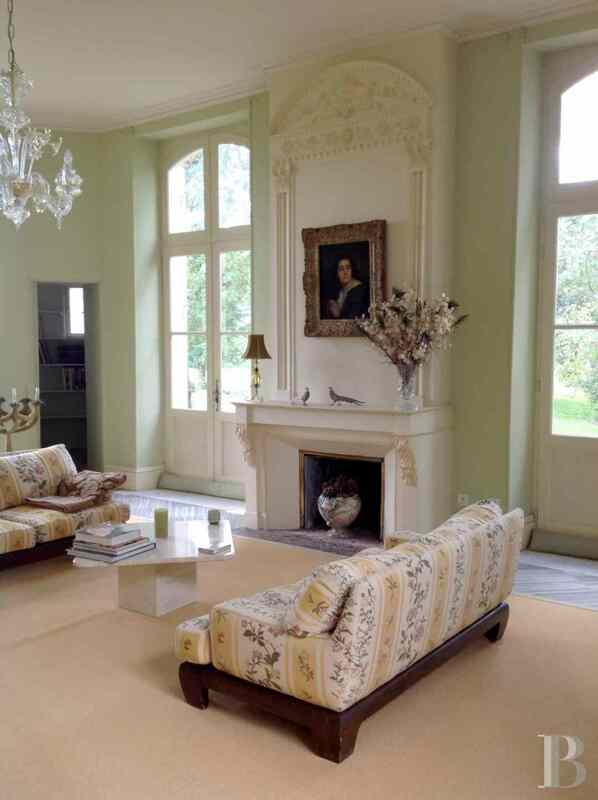 The Directoire period fireplace, also painted white, is made of marble. A kitchen, laid out in the low wing of the chateau, is followed by a secondary entrance hall, with its large cupboard at the end and its back stairway going up to the bedrooms in this wing. 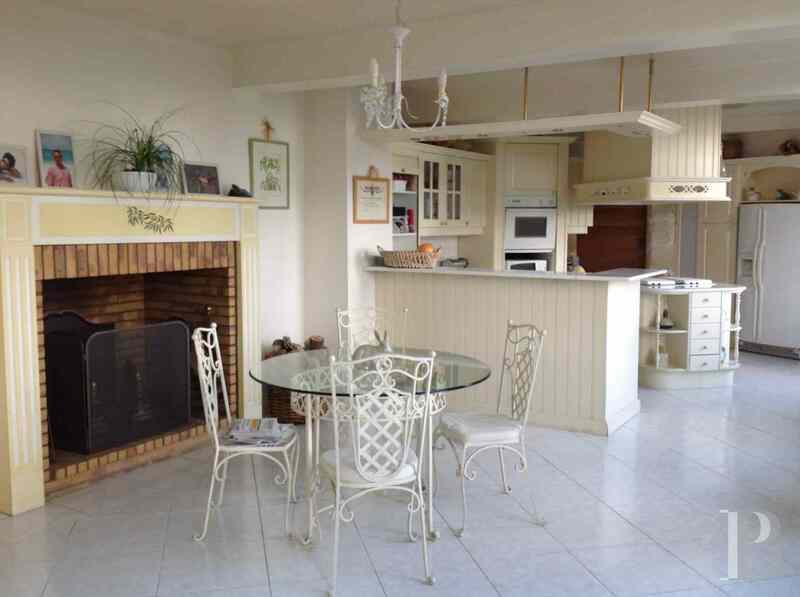 The vast, contemporary style kitchen has large, white floor tiles. 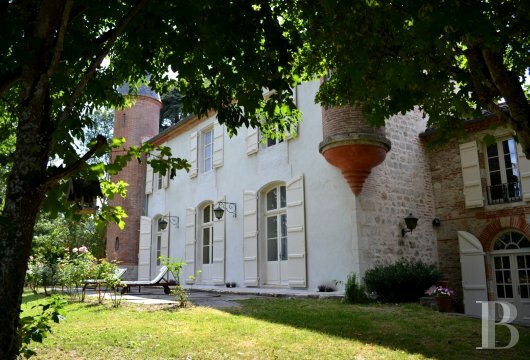 It faces east via two windows and two French windows with fan-shaped fanlights. This room is divided into two sections by a counter. 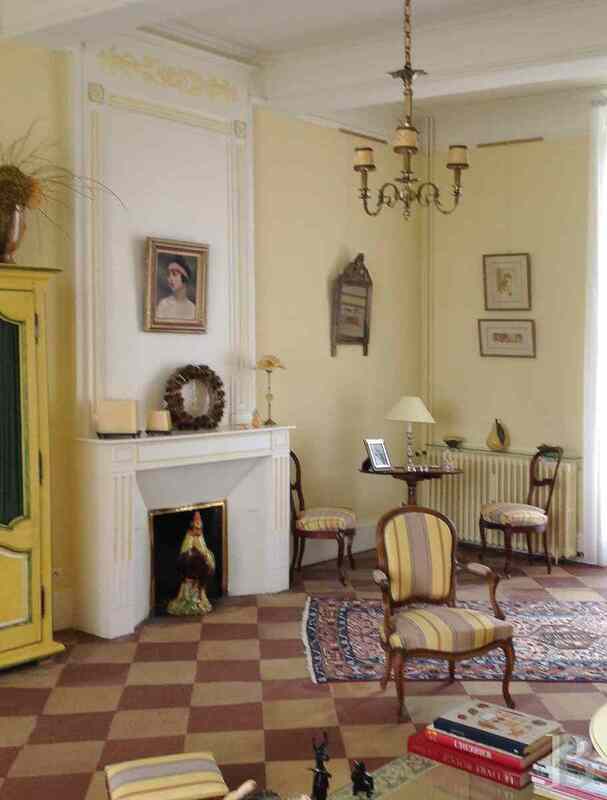 The dining room section has a small, Directoire period, painted fireplace. Although all the fireplaces in the house are in good working order, that of the kitchen is fitted with a system for grilling meat. The south wall features a large cupboard; next to it is a machine room for the heating system. Both sections have gloss white ceilings. A sink has been set on the kitchen side of the counter. A work surface runs along the west wall and, opposite, at an angle in line with the layout of the room, is the cooking section with an electric hob, a chip fryer and a lava stone grill. A large refrigerator-deepfreeze has been recessed in the wall on the north side. 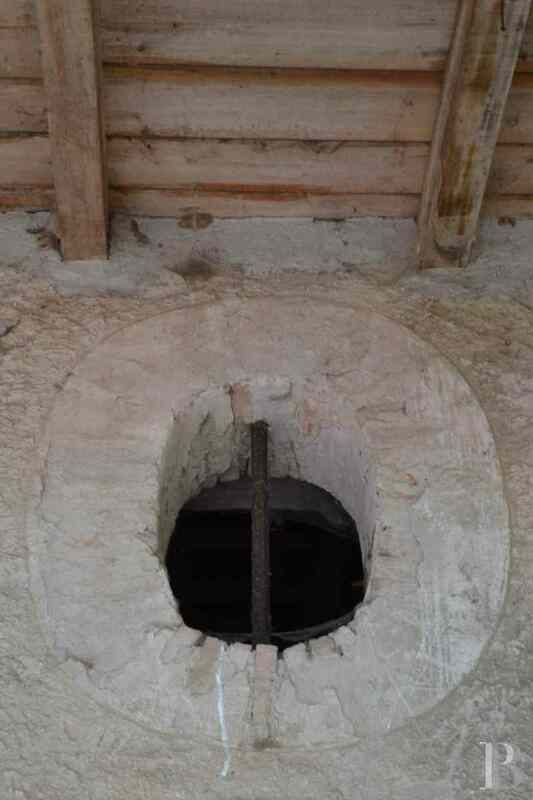 Next to this, in the corner, a door opens into the round tower of the chapel, now a wine storehouse. It still has its cross-ribbed vault. It is possible to reach the first floor via the main stairway, at the end of the gallery, or via the back stairway in the small hallway adjoining the kitchen. 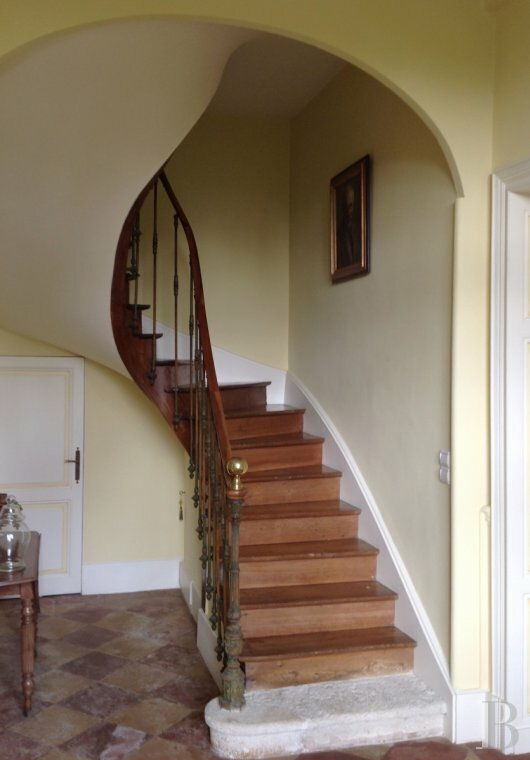 The main stairway goes up to a landing with parquet flooring and terracotta floor tiles. It leads to a large bedroom on the south side, directly above the large lounge. This extremely bright, triple aspect room has five windows. The floor is laid with wide strip, plane wood flooring. 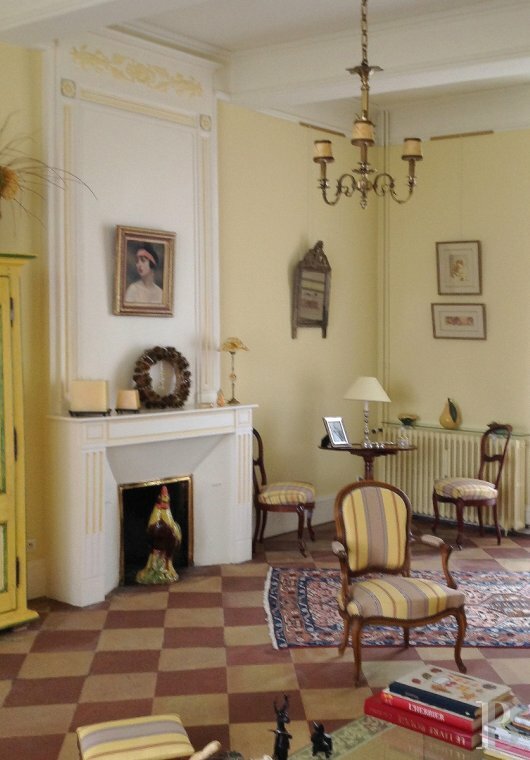 The room features a straight fireplace with a trumeau adorned with decorative plasterwork. As in the large lounge, two doors in two corners lead to dressing rooms laid out in the corner towers. An adjoining bathroom, set on the landing, has large grey marble tiles, a shower, a wash-hand basin, a toilet and a spa bath. The guest bedroom, directly above the second lounge, is on the other side of the landing. Its west-facing window provides spectacular views of the setting sun every day. This room has a large wardrobe, with a moulded door, a Louis XVI style fireplace, painted white, with a trumeau adorned with decorative plasterwork. The adjoining bathroom has an air of the 1930’s. Its large window faces east. 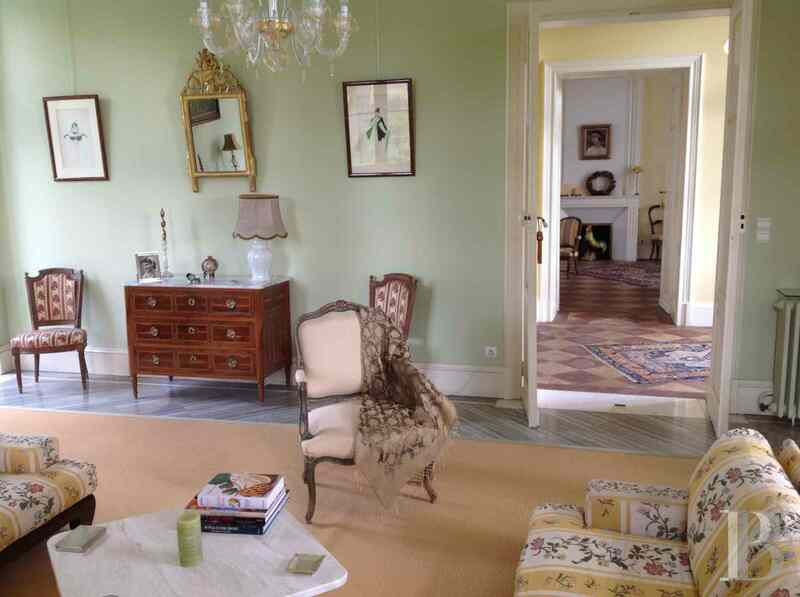 It has a large wardrobe similar to that in the bedroom, giving the impression that it was once part of a single room running the full depth of the chateau. A door in the north-west corner of the bathroom opens into the watch-tower on the east facade. 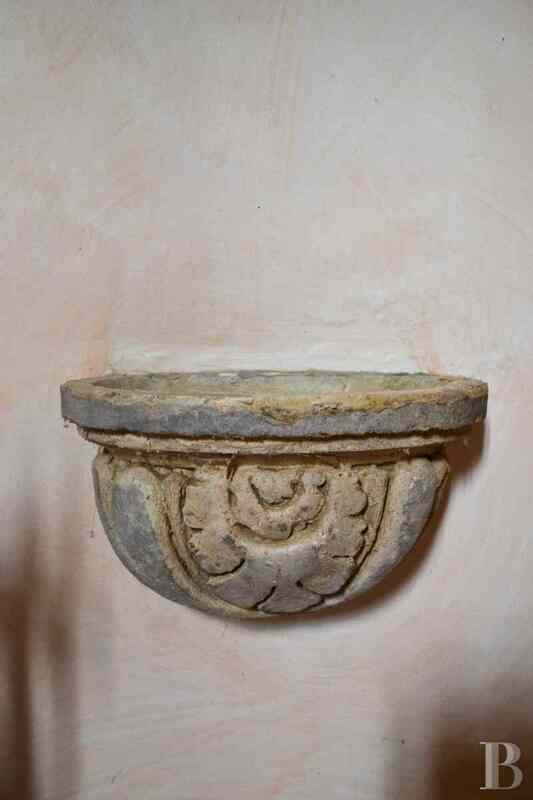 The previous owners illuminated it on function days, like a lantern showing the guests the way to the house. Next is the landing for the back stairway, made of young elm wood, which goes up from the small hallway adjoining the kitchen. A corridor, running in a northerly direction, leads to a shower room, followed by a linen room, then a bedroom-study, with two east-facing windows overlooking the parklands and recently laid oak wood flooring. The white-painted ceiling features exposed beams and joists. The second room is currently a study, with an east-facing window, a straight ceiling, recently laid parquet flooring and a bathroom area set in a corner. At the end of the corridor, a door provides access to the first floor of the chapel. The floor is covered with PVC. It has two windows and a low ceiling with a central beam. The attic above is reached via parrot-ladder stairs which go up to the two levels in the attic, previously converted into a games room for children. The superb keystone of the round roofing framework can be seen on the second level. The east-west facing outbuildings, set at right angles, have not been modified. A first door opens into a workshop. It is followed by an area used for storing bins. 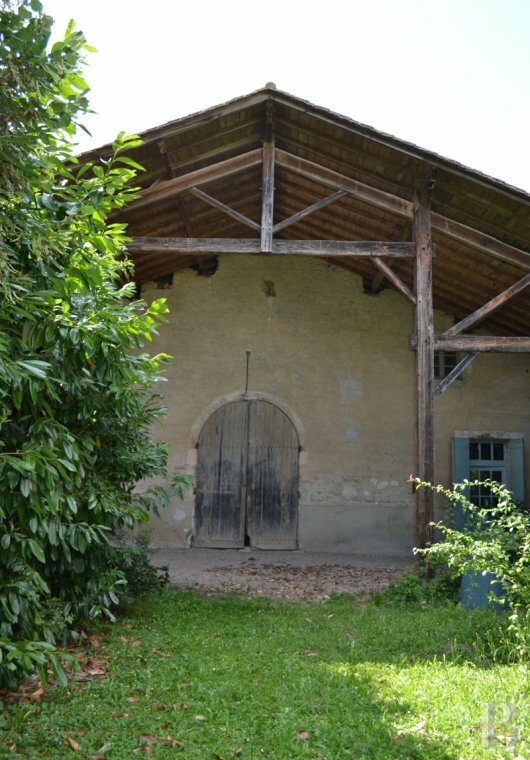 The tall door of the original barn, at the end, features an arched lintel. It has a cement floor. The truss of the roof, totally redone in 2007, is exposed. The window is on the east side. A ladder stairway leads to a large room with one window on the south side and two others on the north side. The ceiling is lined with plasterboard. 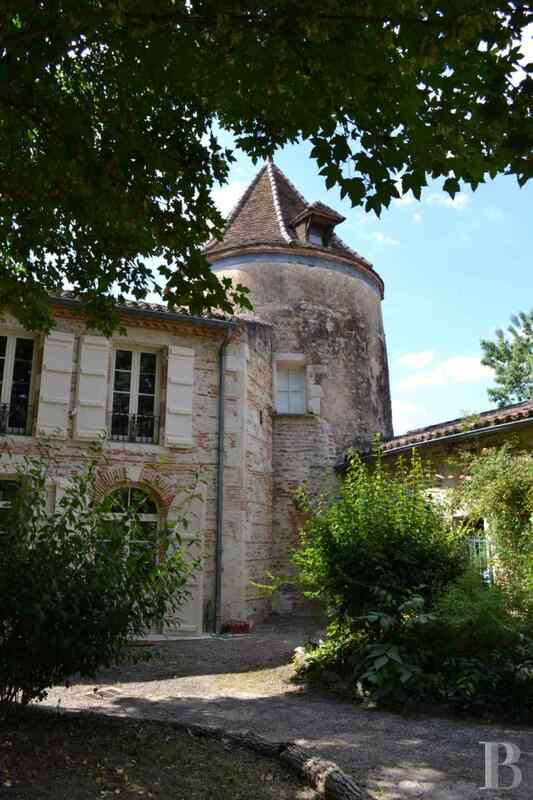 At the end, an attic adjoins the round tower of the chapel. This set of outbuildings spans a total floor surface area of approx. 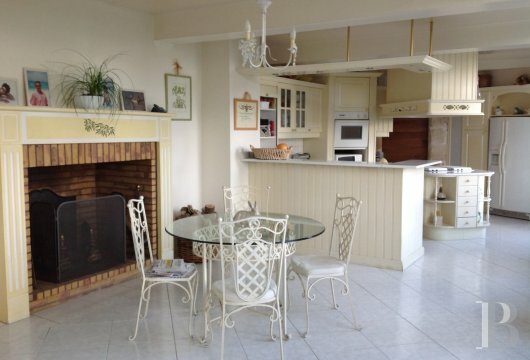 160 m². 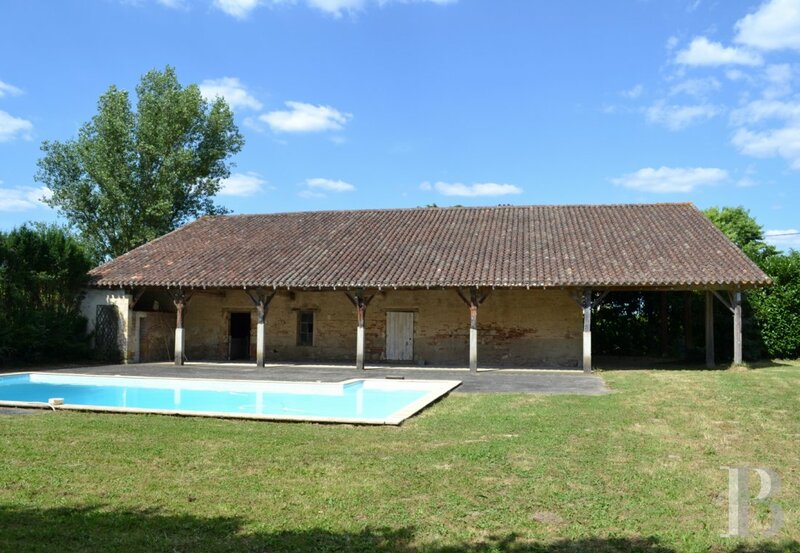 A swimming pool has been installed between the outbuildings adjoining the main residence and the vast, old barn on the north side. It is well concealed by a thick laurel hedge. This L-shaped pool, more than 12 m in length, has a diving well. 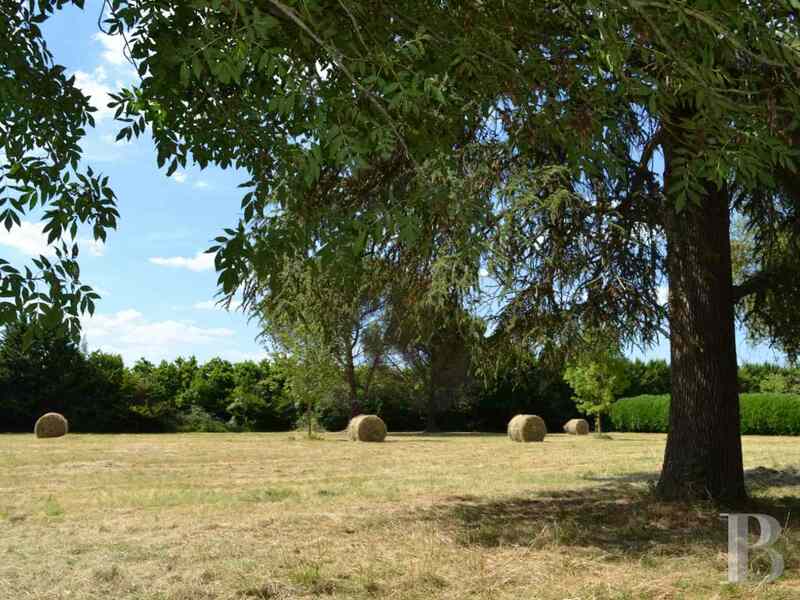 It is fitted with a solar shower and a heat pump. The barn, spanning a total ground surface area of approx. 220 m², is separated from the swimming pool by a cement terrace. On the south side, an immense covered area has a tile roof supported on wooden pillars, like the gallery of a rustic cloister, going up to the height of a narthex in front of the barn’s large haystack doorway, at right angles on the east side. Old tiles are laid on new battens. The pool’s machine room is at the end of the covered area, on the west side. A door, on the north side, leads to a cowshed section which still has its mangers. The barn’s tall door, on the east facade, opens into two vast rooms, once cowsheds. This section awaits full conversion works. Further to the north on the same facade, a door opens into a rustic dwelling spanning approx. 60 m². It comprises a room, with a large stone fireplace, a cement floor and a north-facing window, two other areas, with large terracotta floor tiles, both illuminated via a north-facing window. 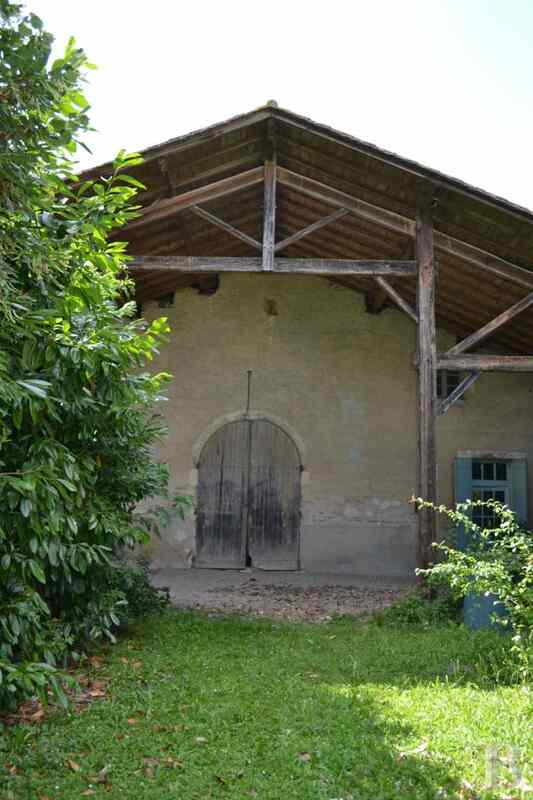 Once renovated, this small dwelling would make a very pleasant caretaker’s or rental cottage. 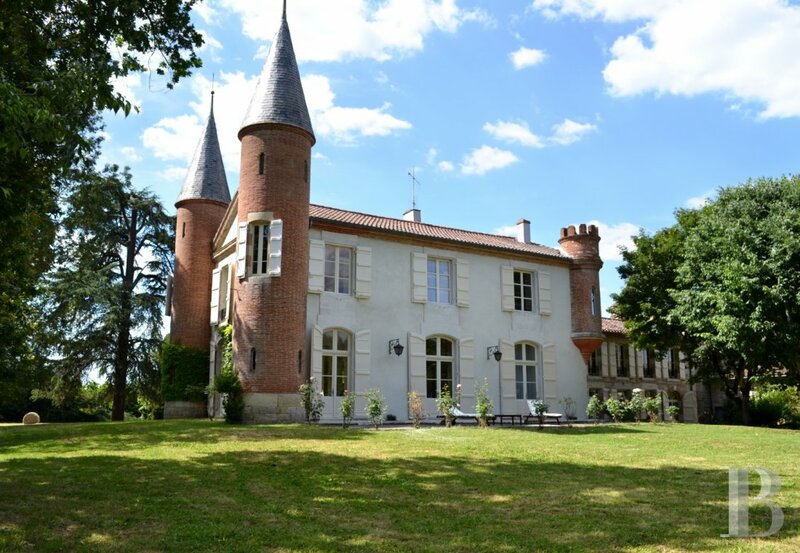 The beauty of this section is that it is independent of the actual chateau and has its own private laurel hedge lined driveway, providing access off of the little road that runs alongside the property. 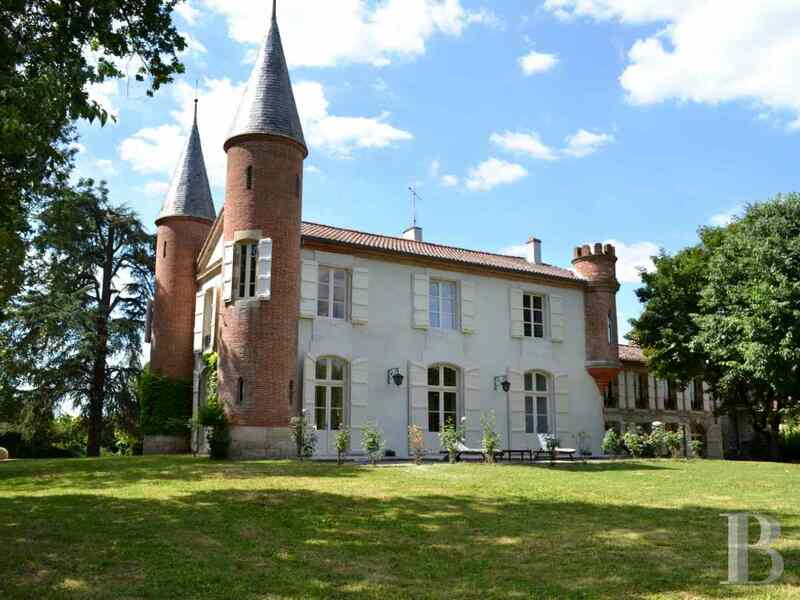 This chateau is worthy of any fairy tale. Its parklands protect it from real life. 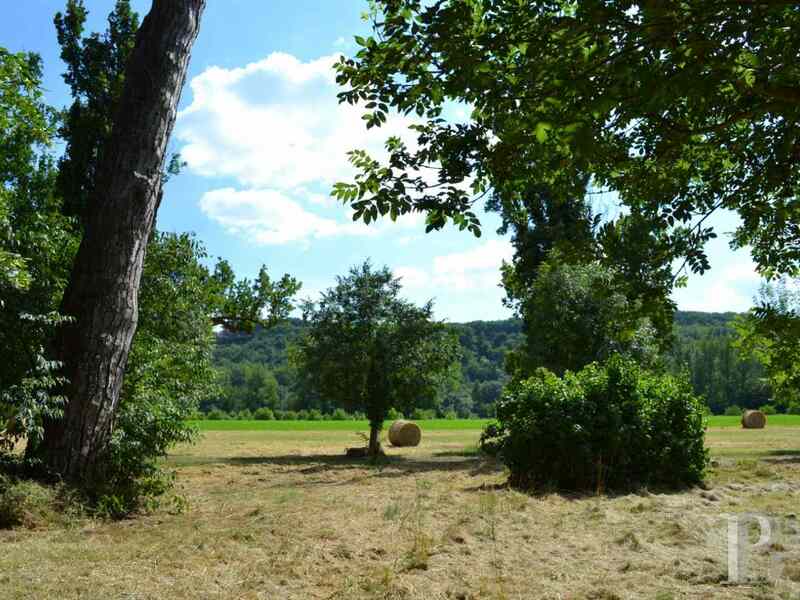 New owners will nevertheless appreciate its proximity to a dynamic town with an excellent communications network. 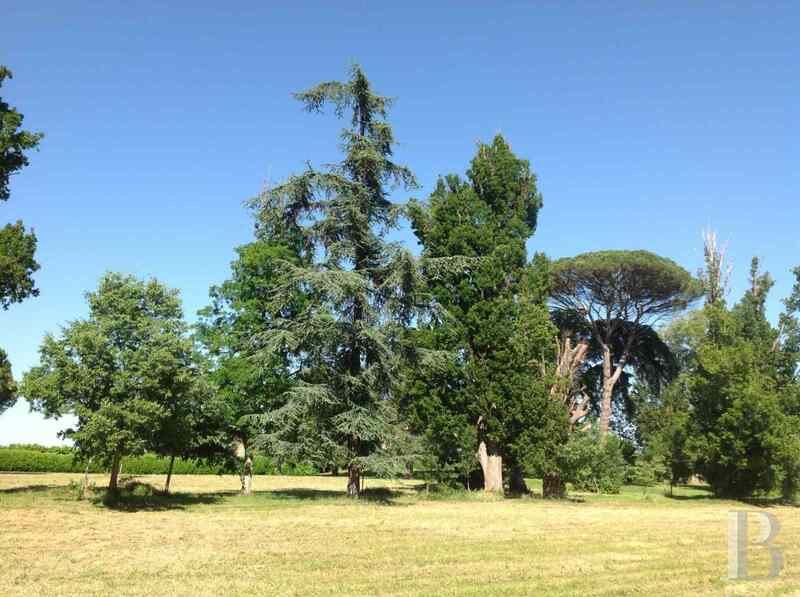 It will make an ideal family home or lend itself to an economic activity, enhanced by its setting, or even both. The current elegant, comfortable layout could be extended to sections that are separate from the main residence in accordance with the project, a restaurant, a health centre, functions, etc. Whatever the case, the power of seduction exuded by the premises can but prevail.